Does Healthy Food Cost Too Much? Therese Hughes, PhD, was honored as the 2015 Alumni Fellow for the School of Public Health and Information Sciences on Wednesday, Oct. 14, 2015. In her address to faculty, staff, students, and alumni during the celebration, Dr. Hughes expressed her gratitude to the SPHIS community for the recognition and spoke about her passion and experience in global health. Dr. Hughes received her PhD in Epidemiology in 2007 and was one of the school's earliest graduates. Dr. Hughes began her career in nursing, graduated with her BSN and spent more than 10 years as a registered nurse working in a variety of health care settings. In 2000, she moved to New York and accepted an internship with UNICEF in their program funding office. This exposure to relationship building and program implementation prepared her to work as the Health Planning Coordinator for the Family Health Centers in Louisville. In that role, Dr. Hughes played a major role in writing grants and managing processes for joint commission, quality improvement, and compliance. In 2001, Dr. Hughes obtained her Master of Public Administration from UofL, and decided to pursue her doctorate in epidemiology at UofL SPHIS in 2004. At SPHIS, she was mentored by Drs. David Tollerud and Susan Muldoon, and was a research associate on the NIOSH-funded project, “Health Effects of Occupational Exposures in Paducah Gaseous Diffusion Plant Workers.” Her dissertation research looked at “All-Cause Mortality” and involved assessing radiation and chemical exposures among Paducah Gaseous Diffusion Plant workers. Following graduation, Dr. Hughes went to the NIH where she worked as a senior research nurse and epidemiologist on studies for the National Institute for Nursing Research and the National Cancer Institute. She joined the HHS Office of Global Health Affairs in 2008, where she spent several years coordinating federal activities related to global health for the Middle East as a Branch Chief and as a Senior Health Analyst. Dr. Hughes worked on policy and programs in partnership with international organizations, foreign ministers, and U.S Government agencies, collaborating with groups such as the CDC, USAID, WHO, and UNESCO. Dr. Hughes returned to Kentucky, and her health care services roots in 2012, when she worked as the Manager of the Quality Improvement Department for Coventry Health Care of Kentucky. Presently, Dr. Hughes works for Baptist Health Lexington as an epidemiologist working in infection control and prevention, which involves conducting epidemiological surveillance activities, preventing transmission of disease, implementing processes for decreasing healthcare acquired infections (HAIs), and investigating, identifying and responding to outbreaks. She works with colleagues to conduct research and define risk factors for hospital acquired and communicable infections, and with the state health department and Centers for Disease Control and Prevention (CDC) on hospital and public health issues. 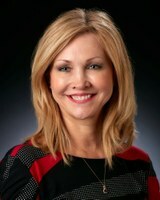 Dr. Hughes has several published articles, conferences presentations, and awards to her name. Notably, she is a member of the Delta Omega Honorary Society in Public Health. She is a member of the Society of Epidemiological Research and APHA. On a personal note, Dr. Hughes is married to John Hughes and they have one son, Michael who is in his medical residency at the University of Louisville. They also are the surrogate parents of a very spoiled rescued chocolate lab mix named Jackson. Congratulations to Dr. Therese Hughes, our 2015 Alumni Fellow! Read about our 2014 alumni fellow, Caroline Chan.